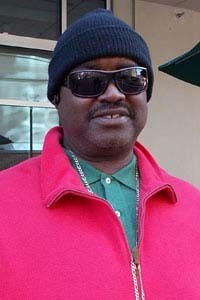 Carl Skinner owned two barbershops in Norfolk and drove a Cadillac. Life was good until things went dark. He began losing his vision and turned his businesses over to others, as his health quickly went downhill. Skinner battled depression as his eyesight worsened due to pressure on his optic nerve. He decided to learn to live without sight after training at the Department for the Blind and Vision Impaired. “I don’t believe in giving up and making excuses,” he said. In 2010, Crystal Hawkins, a Tidewater Community College alumna and friend, told Skinner about TCC, and he enrolled in two classes. “I learned quickly how to network and ask for help. My classmates and TCC security guards helped me to get to the places I needed to go,” he said. On Dec. 18, Skinner will graduate from TCC with an Associate of Applied Science in Human Services. He also appreciated the support and encouragement of Ivory Warren, program head for Human Services. Family is important to Skinner as his mother, Patricia, was his biggest encourager. “Before she died last year, I promised her that I would graduate and make her proud. When I walk across the stage, I’ll be thinking of her,” he said. Skinner is paying it forward and encouraging his sons, Vanlincent Gray, also a TCC student, and Carl Gray to pursue higher education. “I know that I could have given up. But I was determined to live on my own and make a new start,” added Skinner, who will attend Old Dominion University in the spring to work toward his bachelor’s in human services. He plans to become a counselor.